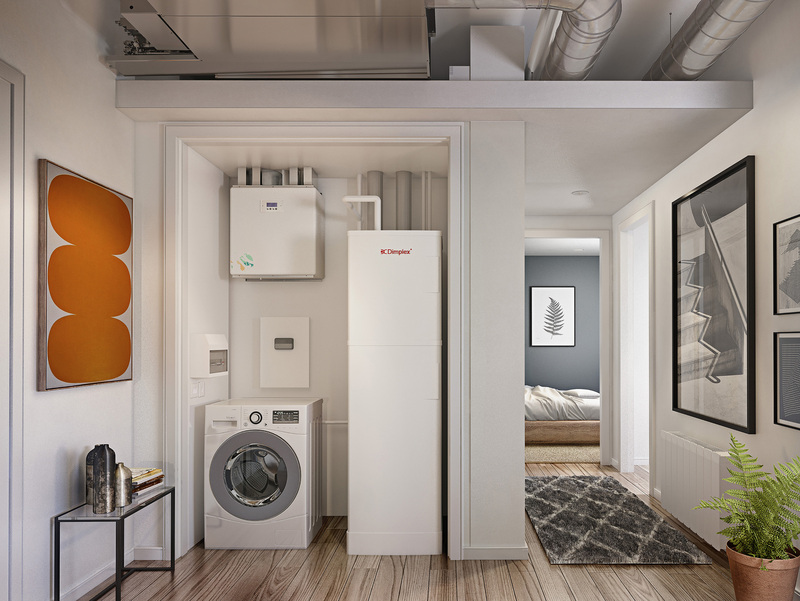 The new Zeroth Energy System from Glen Dimplex Heating & Ventilation (GDHV) offers an innovative new approach to heating and cooling city apartments which is set to revolutionise the way we heat multi-occupancy residential buildings. By creating a series of ‘energy loops’ within the building, Zeroth replaces conventional high temperature systems with a cool, low pressure system, maintained by the building’s central plant room. Low temperature water flows around the building’s main loop to each apartment, which all have their own ‘mini loop’ where an individual heat pump produces heated or chilled water to the desired temperature. The water can then be passed to fan coils, which deliver warm or cold air into a room through vents in the ceiling or wall, or to underfloor heating, or smart electrical, fan-assisted wet radiators. It means more comfortable temperatures within apartments and reduced overheating in communal areas – both common challenges faced with conventional heating and cooling systems for modern apartment blocks. What is more, the cost of heating system losses is no longer spread across all residents, which means they only pay for the heating or cooling they use. Mark Deeney, business development director for GDHV, said: “Those living in modern apartment blocks face a common issue of uncomfortable temperatures and extra costs, simply because building heating systems typically have just one option to accommodate all residents. For more details or call 0800 028 6122.